the smallest of the formed elements in blood, a disk-shaped, non-nucleated blood element with a fragile membrane, formed in the red bone marrow by fragmentation of megakaryocytes. Platelets tend to adhere to uneven or damaged surfaces, and there are an average of about 250,000 per mm3 of blood. The bone marrow produces from 30,000 to 50,000 platelets per mm3 of blood daily, which means that in any ten-day period all the platelets in the body are completely replaced. Called also thrombocyte. The rate of platelet formation seems to be governed by the amount of oxygen in the blood and the presence of nucleic acid derivatives from injured tissue. At any given time about one-third of the total blood platelets can be found in the spleen; the remaining two-thirds are in the circulating blood. Their primary functions are related to coagulation of blood. Because of their adhesion and aggregation capabilities they can occlude small breaks in blood vessels and prevent escape of blood . They also are able to take up, store, transport, and release serotonin and platelet factor 3. Abnormally high numbers of platelets occur in the presence of malignancy, splenectomy, asphyxiation, polycythemia vera, and acute infections. A very low count can occur as a result of idiopathic thrombocytopenic purpura, pernicious anemia, and allergic conditions, and during cancer chemotherapy. Many drugs can cause a toxic decrease in the number of platelets. Platelet response to vascular injury. From Malarkey and McMorrow, 2000.
platelet factors factors important in hemostasis which are contained in or attached to the platelets: platelet factor 1 is adsorbed coagulation factor V from the plasma; platelet factor 2 is an accelerator of the thrombin-fibrinogen reaction; platelet factor 3 is a lipoprotein with roles in the activation of both coagulation factor X and prothrombin; platelet factor 4 is capable of inhibiting the activity of heparin. /plate·let/ (plāt´let) thrombocyte; a disk-shaped structure, 2 to 4 μm in diameter, found in the blood of mammals and important for its role in blood coagulation; platelets, which are formed by detachment of part of the cytoplasm of a megakaryocyte, lack a nucleus and DNA but contain active enzymes and mitochondria. Platelets contribute to chemical blood clotting and to other aspects of hemostasis. Platelet factors are the chemicals released by platelets to initiate the first stage of (intrinsic pathway) chemical clotting. 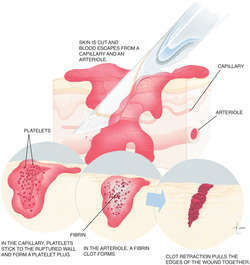 When a capillary ruptures, platelets adhere to each other and to the cut edges of the vessel, forming a platelet plug. Blood clotting may be beneficial (e.g., in preventing blood loss from wounds) or may be harmful when it occurs within arteries or veins inside the body (e.g., during coronary thrombosis). Blood clotting is a positive feedback cascade that may continue and occlude an unbroken vessel. Thrombocytopenia (reduced platelet count) occurs in acute infections, anaphylactic shock, and certain hemorrhagic diseases and anemias. Thrombocytosis (increased platelet count) occurs after operations, esp. splenectomy, and after violent exercise and tissue injury. A fragment of the CYTOPLASM of a MEGAKARYOCYTE 2–4 mm in diameter. Each megakaryocyte produces 1000 to 3000 platelets, which are present in large numbers in the blood-50,000 to 300,000 per cu. mm. Platelets survive for about 10 days and play an essential part in blood clotting. Platelet plasma membranes contain a range of glycoproteins by means of which they bind to different materials including collagen, fibrinogen and von Willebrand factor. Platelets are by no means the passive tissue fragments they were formerly thought to be. They carry many granules and a canalicular system by which the granules are released. They also have a dense tubular membrane system in which prostaglandins and thromboxanes are synthesized. Platelet granules contain heparin-neutralizing factor, von Willebrand factor, smooth muscle growth factor and fibrinogen. Deficiency of platelets is known as thrombocytopenia. An irregularly shaped cell-like particle in the blood that is an important part of blood clotting. Platelets are activated when an injury causes a blood vessel to break. They change shape from round to spiny, "sticking" to the broken vessel wall and to each other to begin the clotting process. Karl W., German histologist, 1861-1935.
n a disc found in the blood of mammals that is involved in the coagulation and clotting of blood. n See factor, platelet, 1.
n 1-0-alkyl-2-sn-glycero-3-phosphocholine. A phospholipid derivative formed by platelets, basophils, neutrophils, monocytes, and macrophages. It is a potent platelet-aggregating agent and inducer of systemic anaphylactic symptoms, including hypotension, thrombocytopenia, neutropenia, and bronchoconstriction. n a clumping together of platelets in vitro, and likely in vivo, by a number of agents, such as adenosine diphosphate, thrombin, and collagen, as part of a sequential mechanism leading to the initiation and formation of a thrombus or hemostatic plug. n.pl the drugs or agents that antagonize or impair any mechanism leading to blood platelet aggregation. n See factor IX and plasma thromboplastin component. n the number of platelets found in 1 mm3 of blood; the normal range is between 200,000 and 300,000 platelets. n a type of protein released by platelets of the blood that aid in the repair and regeneration of connective tissue. n See plasma, platelet-rich (PRP). n 1. the transfer of blood platelets from a donor to a recipient or reinfusion to the donor. n 2. a treatment modality used in treating hemophilia and other conditions of impaired blood coagulation. The PGD test only has to be run once on a platelet dose before it is transfused to reduce the risk of sepsis caused by bacterial contamination. 2 Platelet transfusion improves the management of patients with haemostatic or platelet disorders, reducing haemorrhagic complications and mortality. Each rater performed an independent manual platelet estimate for each blood film. The MPV and platelet counts are established indicators of the thrombotic potentials for micro vascular complications in individuals with DM4,5. For example, one study found presence of antibodies directed against dengue virus nonstructural protein 1 (NS1) that showed cross-reactivity with human platelets and endothelial cells, which lead to platelet and endothelial cell damage and inflammatory activation. 5 Besides flow-cytometric quantification of RP the inexpensive test for rapid assessment of immature platelet function (IPF) by automated hematology analyzers, may be useful to evaluate patients with thrombo-cytopenia. We know the Platelet BioGenesis team well from their days at MassChallenge and so we're delighted that Amgen has selected the company as a 2016 Golden Ticket winner it's an excellent choice," commented LabCentral Co-Founder and President Johannes Fruehauf. One non-invasive method of understanding the underlying cause of thrombocytopenia is to measure the immature platelet fraction (IPF), which indicates the presence of immature platelets in the peripheral blood. Empiric antibiotic coverage was started, and as her platelet count decreased below 10,000/[micro]L, she was transfused platelets. As the point that platelet activation results in morphologic variations of platelets is known, a sequence of platelet parameters measured by hematology analyzers have been applied by several researchers. in this issue provides additional information to help select assays for platelet function assessment (4 ).